Applications that should ship with the Librem 5 by default but are not in the top priority of development. Limited (in bandwidth and storage) gratis services that will be available on the first launch of the Librem 5. Additional bandwidth and/or storage for the default services + the following subscription only services. **Call** (to be implemented): The Call app can handle both regular and secure (VoIP) calls. **Messages** (to be implemented): The Messages app can handle both regular (SMS) and Secure (IM) messages. **Mail** (`Geary <https://wiki.gnome.org/Apps/Geary>`_): The Mail app can read and send PGP encrypted emails in the most transparent way possible. **Contacts** (`GNOME Contacts <https://wiki.gnome.org/Apps/Contacts>`_): The Contacts app details to be used by the Call, Messages, and Mail applications. **Web** (GNOME Web aka `Epiphany <https://wiki.gnome.org/Apps/Web>`_): Simple web browser with security enhancements (PureBrowser). **Calendar** (`GNOME Calendar <https://wiki.gnome.org/Apps/Calendar>`_): The Calendar app can sync with online calendars (like Nextcloud calendars). **Camera** (`Cheese <https://wiki.gnome.org/Apps/Cheese>`_): The Camera app is able to take pictures and videos and is able to share them through different protocols. **Settings** (`GNOME Settings <https://wiki.gnome.org/Design/SystemSettings/>`_): The Settings app is used to access the settings of the system as well as the settings of each application. **Calculator** (`GNOME Calculator <https://wiki.gnome.org/Apps/Calendar>`_): A simple, easy to use calculator. **Terminal** (`GNOME Terminal <https://wiki.gnome.org/Apps/Terminal>`_): A simple terminal to be used with a specific virtual keyboard layout including ESC and CTRL keys. **Clocks** (`GNOME Clocks <https://wiki.gnome.org/Apps/Clocks>`_): The Clocks app includes World Clocks, Alarm, Stopwatch, and Timer features. 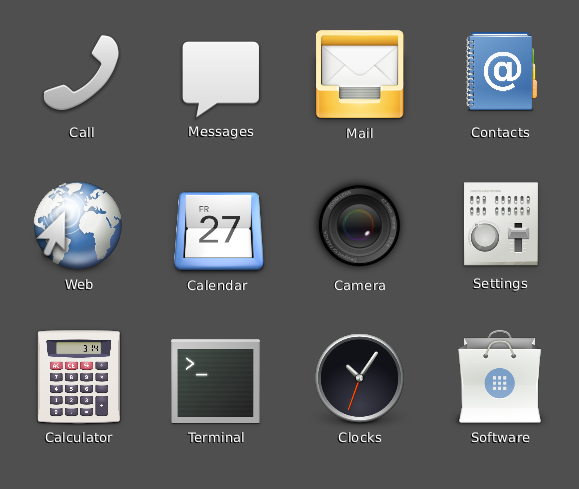 **Software** (`GNOME Software <https://wiki.gnome.org/Apps/Software>`_): An "App Store" including only free software to be easily installed on the system. **Chess** (`GNOME Chess <https://wiki.gnome.org/Apps/Chess>`_): What would be a modern smartphone without a game? **Weather** (`GNOME Weather <https://wiki.gnome.org/Apps/Weather>`_): Weather forecast for different locations. 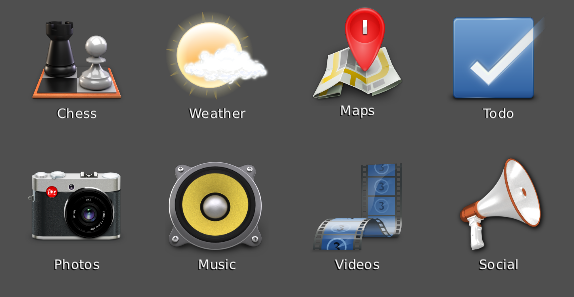 **Maps** (to be implemented): Maps application with a directions feature. **To Do** (`GNOME To Do <https://wiki.gnome.org/Apps/Todo>`_): A task list application that can be synced with online data sources like Nextcloud. **Photos** (`GNOME Photos <https://wiki.gnome.org/Apps/Photos>`_): A Photos application to organize, edit, and share photos. **Music** (`GNOME Music <https://wiki.gnome.org/Apps/Music>`_): A music player to organize and play many kinds of music files. **Videos** (GNOME Videos aka `Totem <https://wiki.gnome.org/Apps/Videos>`_): A video player to browse and play many kinds of video files. **Social** (to be implemented): Social is a Mastodon client. Purist Services is a suite of no-knowledge free software online services that are all accessible through a single account and tightly integrated with PureOS through different applications. These services can also be self-hosted in a decentralized manner. The "Customer's Pack" includes all the gratis services that are available on the first launch of the Librem. These services have some limitations in bandwidth and storage (because they are gratis), but are available to anyone, including users on other devices. Librem customers can choose not to use the services from Purism and may decide to setup their applications with different service providers or even setup the Purist services on their own server. **Calling** (`Matrix <https://matrix.org/blog/home/>`_): A VoIP service allowing end-to-end encryption. To be used through the "Call" application. **Messaging** (`Matrix <https://matrix.org/blog/home/>`_): An instant messaging service allowing end-to-end encryption. To be used through the "Messages" application. **Mail** (`IMAP <https://en.wikipedia.org/wiki/Internet_Message_Access_Protocol>`_): The Mail service is used to define an email address that becomes the single user id through all the Purist Services. A mailbox with a limited size may be given for free as part of the Customer's Pack. To be used with the "Mail" application. **Social** (`ActivityPub <https://activitypub.rocks/>`_): A Mastodon service for federated micro-blogging. Additional bandwidth and/or storage is available for a monthly subscription. In addition, the following services are available only by subscription. These can also be used on any platform (with compatible clients). **Backup** (`Nextcloud <https://nextcloud.com/>`_): Keep regular encrypted backups on a remote server and and restore in the event of a disaster. experience is beautiful, magical, and delightful. To read more about our our feelings on ethical design, take a look at `this blog post <https://puri.sm/posts/we-love-ethical-design/>`_. 7x7 - 9x9mm and cozy space of 14x14mm. This is the design of the phone shell, called :ref:`phosh`. 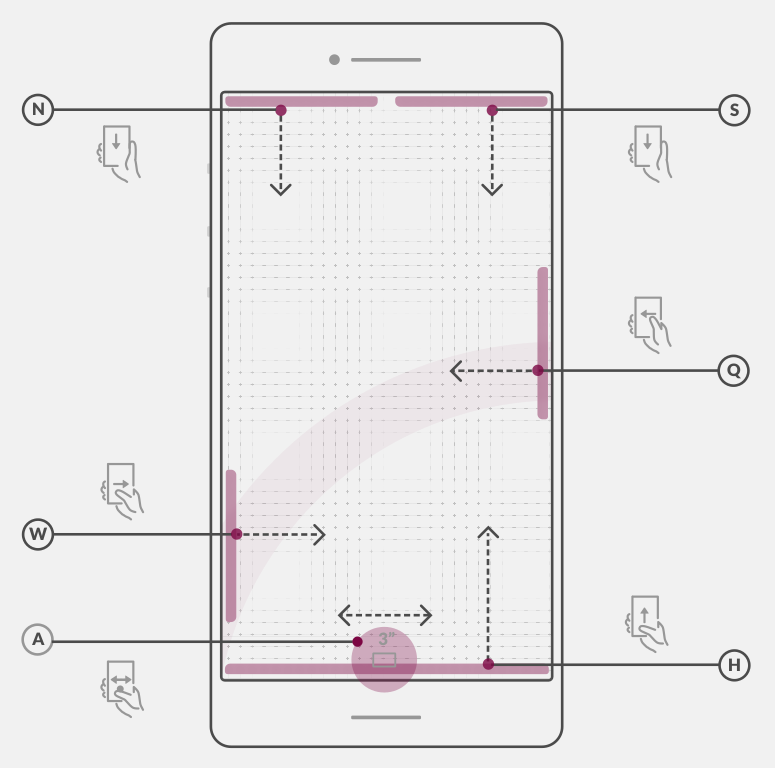 Starting from the leftmost picture, you can start to get a feel for the stages to be expected on the phone through the various states. 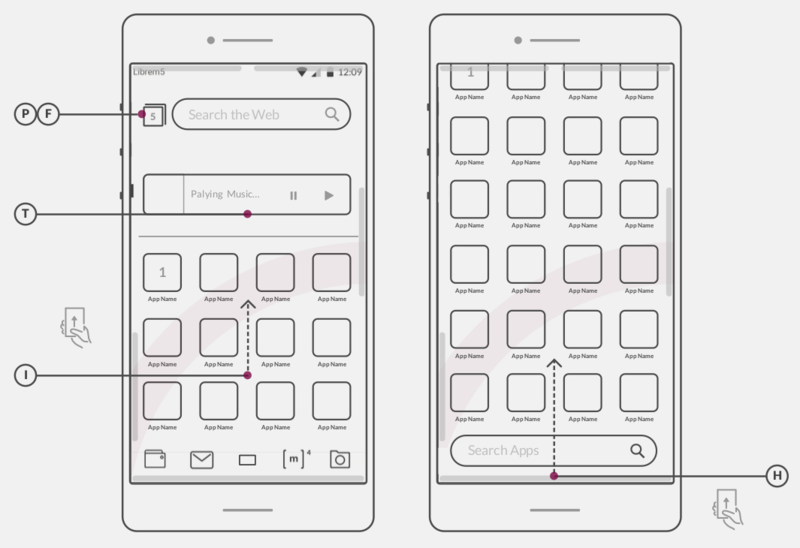 The user will open up an application that will be full screen with two additional interactive points: can slide down from the top or tap the bottom bar to return to the home application screen. 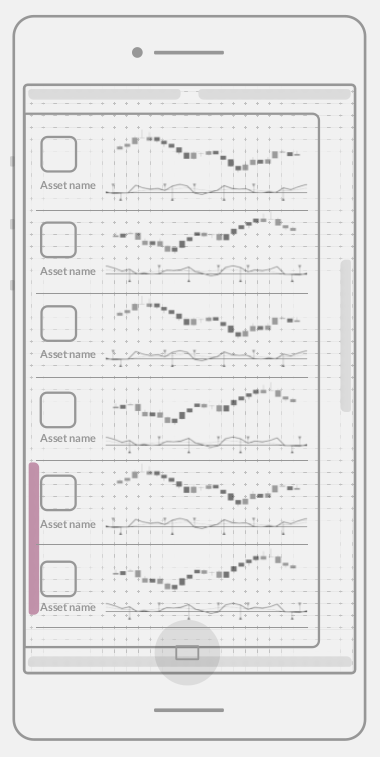 The "Power off" screen is also displayed in this picture along with a mockup onscreen keyboard. 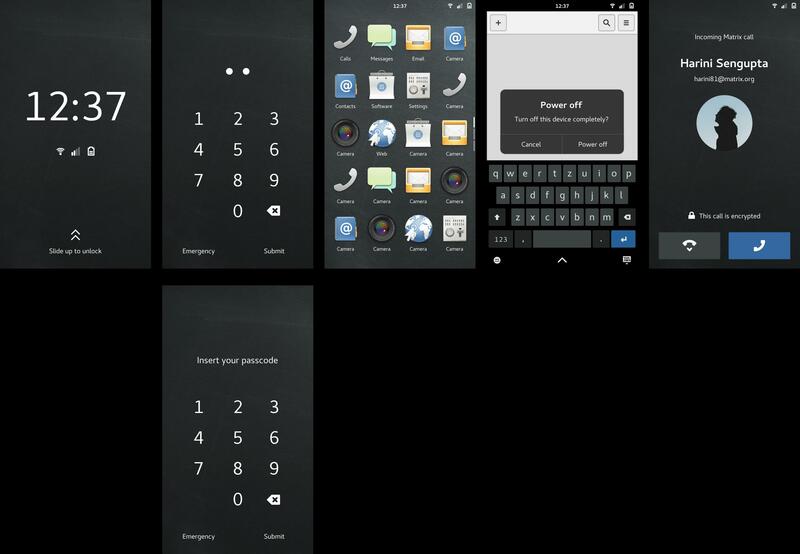 Finally, the rightmost image displays what an incoming phone call will look like. GSettings, DBus) and uses a patched rootston_ as Wayland compositor. * :ref:`app_development` - Find out all abnout how to make, build, deploy, and publish apps. 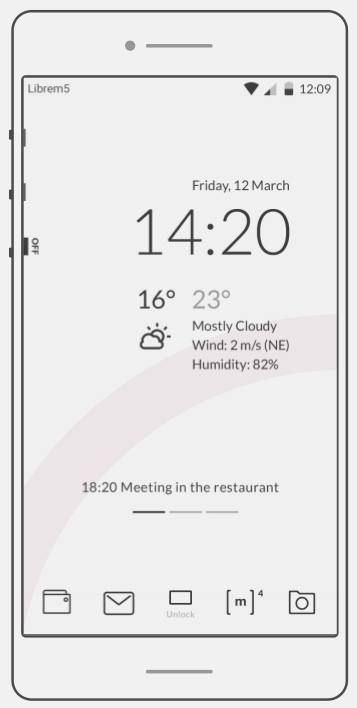 * :ref:`design` (to be implemented) - Take a look at the expected look and feel of the Librem 5 phone. As an app developer, you can get an idea of how apps fit into the overall user interface. * :ref:`phosh` - Learn how to setup the wlroots-based phone shell for development. 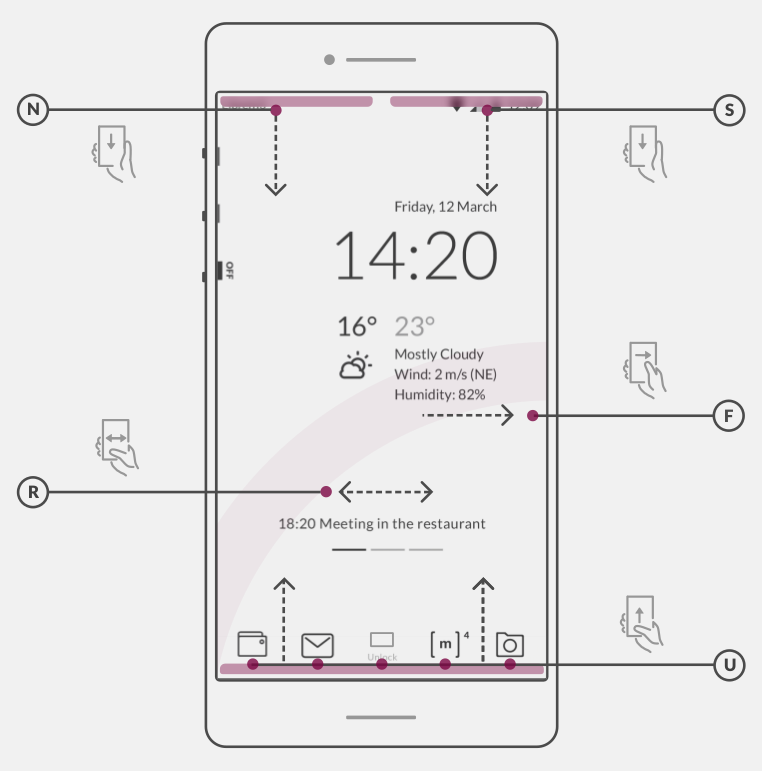 * :ref:`plamo` - Walkthrough to setup Plasma Mobile.